Market analysts have given a thumbs-down to the general election 2019 manifestos of both leading parties, the Indian National Congress (INC / Congress) and the Bharatiya Janata Party (BJP), saying the measures promised to the electorate are populist and can put pressure on the fiscal situation. The measures come at a time when Skymet, a private weather forecaster, has already cautioned against lower-than-normal monsoon this year, which in turn can stoke inflationary pressures in the economy. The Congress’ flagship poll plank this time around is the minimum income guarantee scheme, NYAY (Nyuntam Aay Yojna). 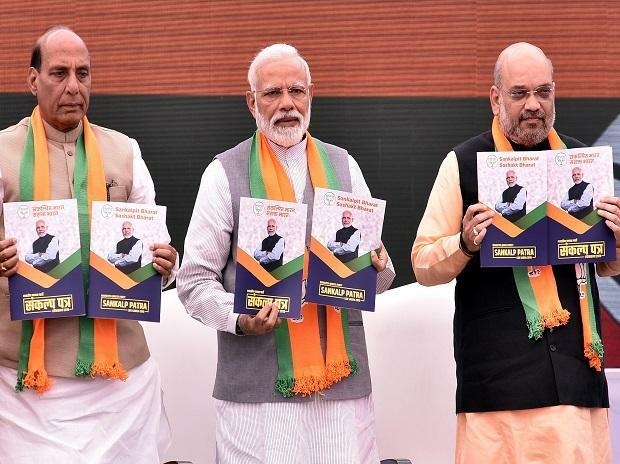 The manifesto is structured with the aim of capitalising on popular discontent against the incumbent BJP on areas like farm distress, unemployment, anti-poor perception, and tax and regulatory challenges for small businesses. “The NYAY scheme, along with proposals of universal farm loan waiver, increased healthcare and education outlay – are at odds with the INC’s concurrent aim of fiscal deficit at 3 per cent of GDP (gross domestic product). Likely compromises will be in the momentum of public capex, or higher taxation; both of which could also run afoul of the manifesto’s commitments,” wrote Sonal Varma, managing director and chief India economist at Nomura in a recent co-authored report with Aurodeep Nandi. BJP, on the other hand, unveiled plans to make India a $5 trillion economy by 2030 and $10 trillion economy by 2032; has promised pension to small and marginal farmers, interest-free Kisan Credit Card loans and Rs 25-lakh investment in the agri-rural sector, digitisation of land records, simplification of goods and services tax (GST) and doubling the length of National Highways by 2022 while unveiling its manifesto for the upcoming general elections. “We expect the other parties to compete for the attention of the poor in the run-up to the elections. Besides the focus on economy, the marketing plank will be focussed on pro-poor schemes. The pressure on the fiscal situation is just justified, especially at a time when the monsoon can also disappoint. I think more populist expenditure is on cards if the mandate is a hung Parliament or a coalition government. It can happen at the Central level, State level, or both,” says Jigar Shah, CEO, Maybank Kim Eng Securities. Since the announcement of election dates in March, the S&P BSE Sensex has rallied 6 per cent, while the S&P BSE Mid-cap and S&P BSE Small-cap indices have surged around 5 per cent and 4.1 per cent each. Analysts at Emkay Global estimate the expanded version of PM Kisan Yojna to cost the exchequer over Rs 2 trillion, compared to the minimum basic income scheme for the Congress, which is estimated to cost Rs 3.6 trillion. “Both the BJP and Congress are seen indulging in competitive populism to woo the voters. Farmers have become an important vote bank, especially after the recent state elections where in their distress has impacted the outcome for the BJP. This is particularly true in the Hindi heartland, where many states have 70 – 80 per cent rural/agri constituencies. For the markets, competitive populism will cause concerns on the fiscal situation," said Krishna Kumar Karwa, managing director, Emkay Global Financial Services. G Chokkalingam, founder and managing director at Equinomics Research, too, believes the measures announced by both the leading political parties are populist and can put the fiscal situation under strain in the financial year 2019 – 20 (FY20). “The markets are not worried about the fiscal situation right now. The only thing on their mind is political stability and continuity of reforms and policies by the next government. If the monsoon, too, is below normal, inflationary pressures could increase,” Chokkalingam says.